In my younger days I would imagine most people would have described me as a dreamer. I was always full of ‘bright’ ideas but then at aged 10 you don’t tend to have the means or cash flow to follow things through! So I started doing my house hold chores and saving my pocket money and my first dream came true about aged 12 of owning the fastest car in the world. 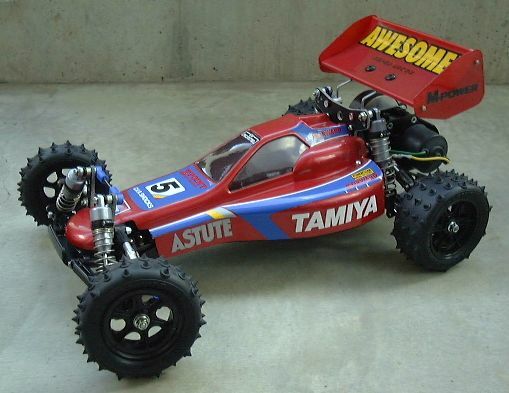 The Tamiya Astute 1/10th RC buggy! I think this was the pin up model of Tamiya’s buggy collection at the time and it went on to win the RC world championships the year it came out beating off the previous front runners from Team Associated and Kyosho. To be fair I had had my heart set on a Team Associated RC10 but that is another story! Unsurprisingly this model did not stay factory for long.. I soon had a massively uprated motor and battery packs along with suspension uprgades and servo controls etc! I guess that’s when my need for speed and passion for 4 wheels was really born. That and the fact my dad was an engine builder by trade and always playing with cars too! Now-a-days I would prefer to describe myself as someone who likes to realise. But then behind every good realisation is a great dream.. So in fact every realist is a dreamer at heart! ?